This is a modern road which took the place of the dismantled railway, indeed, it runs up the course of the railway goods sidings. 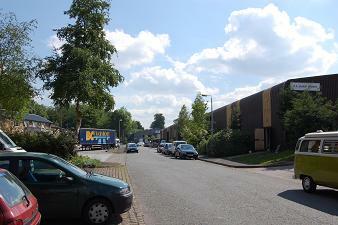 This is an entirely industrial area although Clough Bank House has its access at the top end of the cul de sac. Nearest shops – Wellington Road. The bottom picture shows the view out of Clough Bank across Grimshaw Lane to the Middlewood Way. This was once the route of the railway with a bridge crossing Grimshaw Lane. 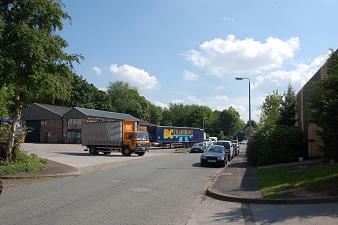 The Middlewood Way footpath is located to the west of Clough Bank, protected from the street and behind the industrial buildings. There is a pedestrian access from this path, across the street to Tinkers Clough , just by the entrance to Clough Bank House. 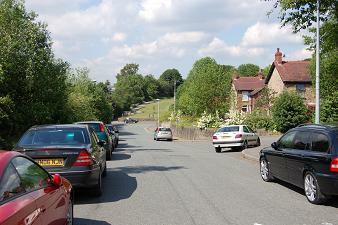 There is a car park for users of the Middlewood Way on the right at the entry to Clough Bank. However, this is normally full during office hours.